Hi everyone! I’ve got my favorite type of craft project to share with you today – one that takes minutes to do and takes something you likely already own up a notch. 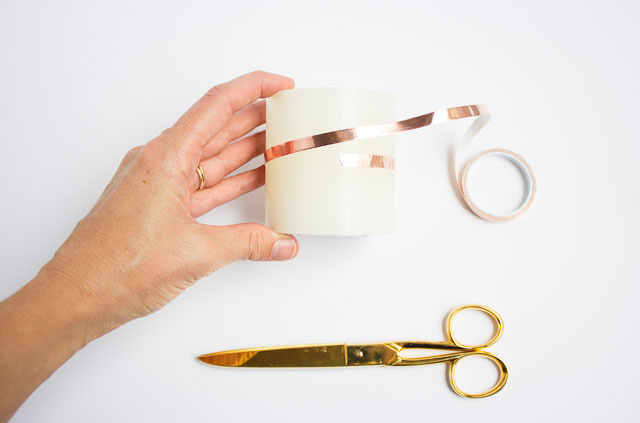 I’m wrapping plain flameless LED candles with copper foil tape for a modern and festive look for fall. I don’t know about you, but I am a flameless candle convert. I have them throughout my house at this time of year. I just love when our fireplace mantel automatically gives off a soft glow at night thanks to the nifty timers that come with most flameless candles. 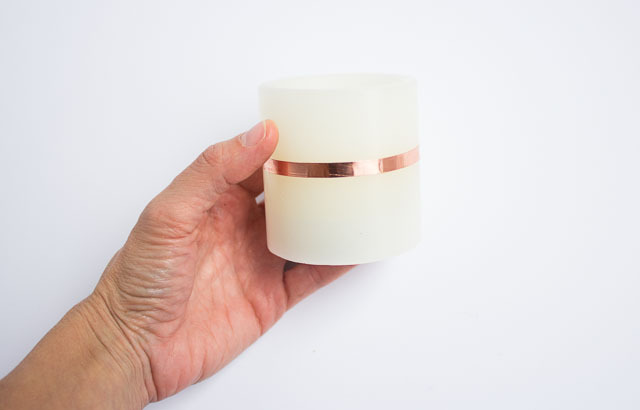 They also happen to offer up DIY possibilities that traditional candles don’t (no fire risk)! I have made yarn-wrapped candles before for a cozy fall look. 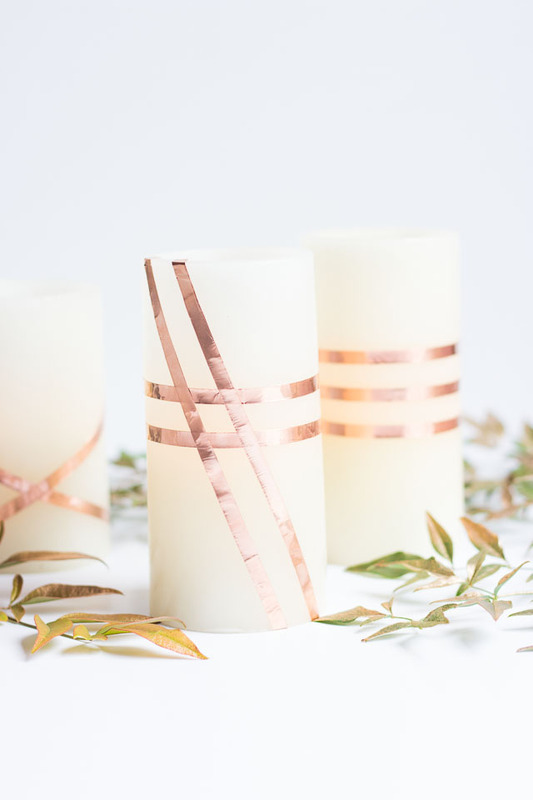 This year I’m hooked on all things metallic, so I wanted to give my candles a shiny copper makeover. 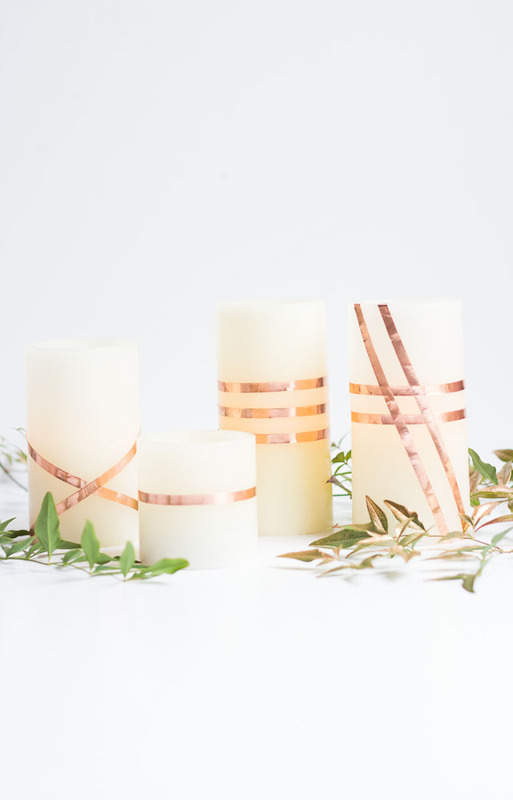 These DIY copper-wrapped candles would make for pretty Thanksgiving table décor. 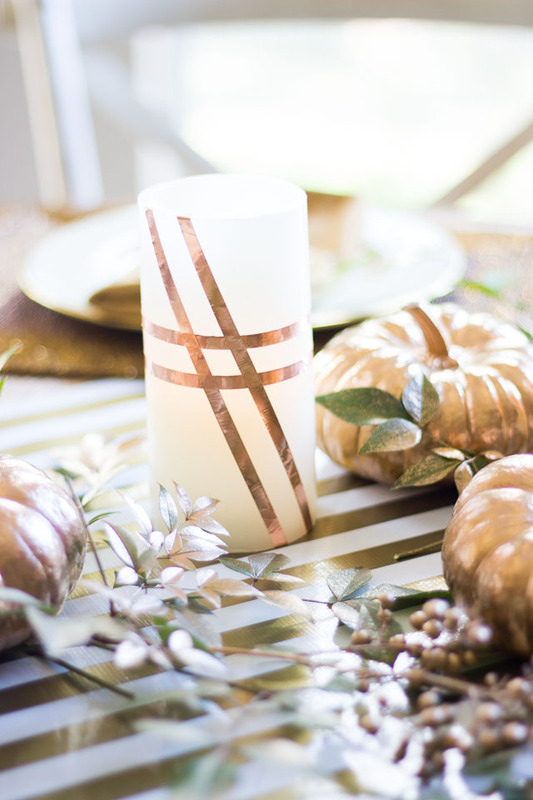 I paired mine with some small pumpkins and greenery from our yard that I painted with copper spray paint. I just gave a light coat to the greenery, letting some of the leaves show through. I love their “copper kissed” look! The table runner is actually a piece of gold striped oilcloth I cut to fit the table, and the bronze leaves used as place cards are a $2 thrift store find. I always recommend shopping your house for unexpected pieces to incorporate into your table décor. You’d be surprised with what you can pull together from things you already have! 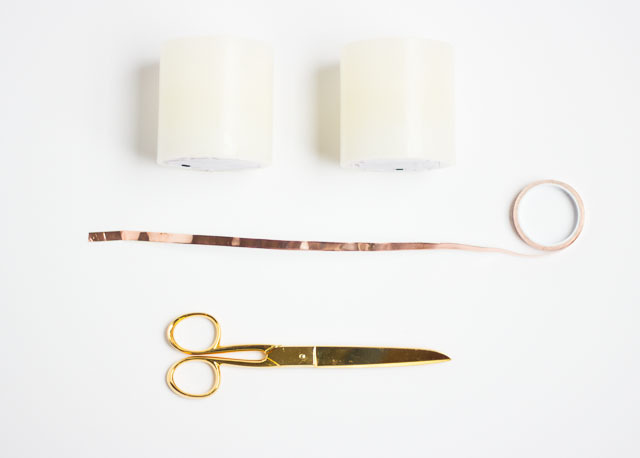 Wrap the tape around the candle in whatever direction you want, removing the tape backing and smoothing the tape down with your finger as you go along. Trim with your scissors and that’s it! 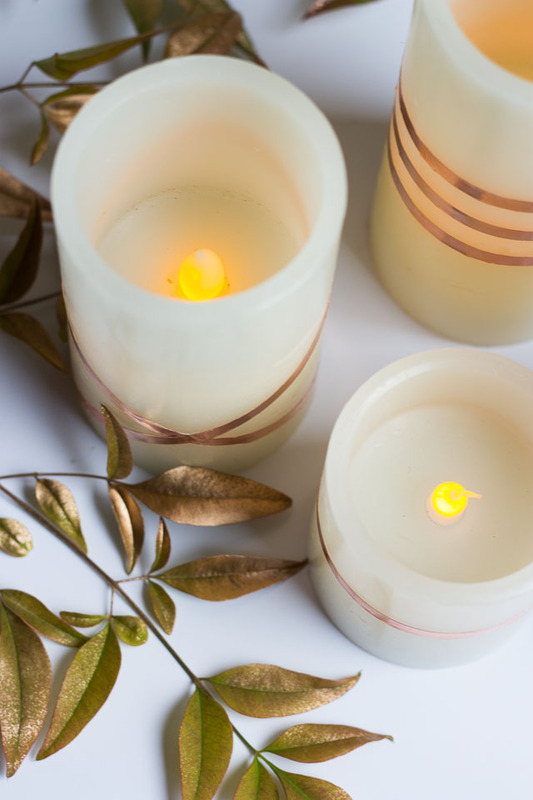 If you decide you want a different look for your candles after the holidays, just peel off the tape. 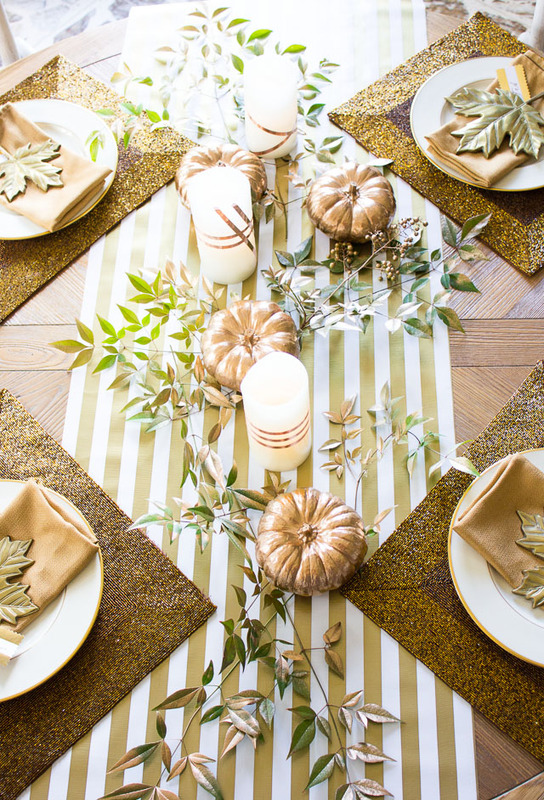 Want more fall table ideas? 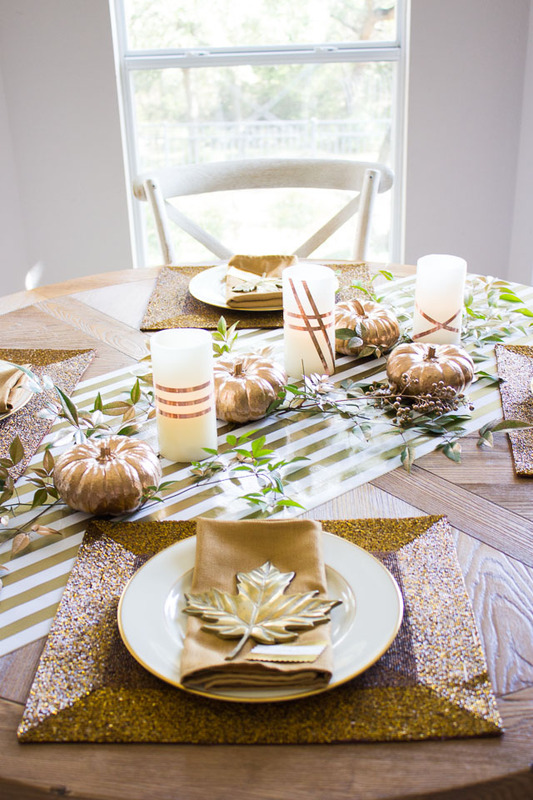 Don’t miss this Thanksgiving table and this thrifted fall table decor!